Our first false start happened because the rules were just too complicated to get into. The iconography was difficult to decipher and the flow of the game could be describe as somewhat all over the place. So we sat down, tried to learn, then abandoned the game. The second false start was when Eric lied - outright people ! outright ! - to me that the 2 player game would be quick. We finished the 1st of 3 eras in about 40mins before a friend came over, so being the polite human beings we are, we stopped there and then. Of course being the polite human beings we are, we decided to induct him into our game and start a 3 player game ! Well, after another hour, we finished the 1st of 3 eras and 2 other friends came along. What's with people coming in after the 1st Era is done ? Can't they just leave us all alone ! So well, we stopped again. Game uncompleted. It was only when everyone had left and there was just the 3 of us left that we decided we were going to finish the damn thing. So we did. I think by now you should know that the game has to be somewhat decent enough to make us want to play it through after 3 false starts right ? Well, Yes, the game is pretty good. 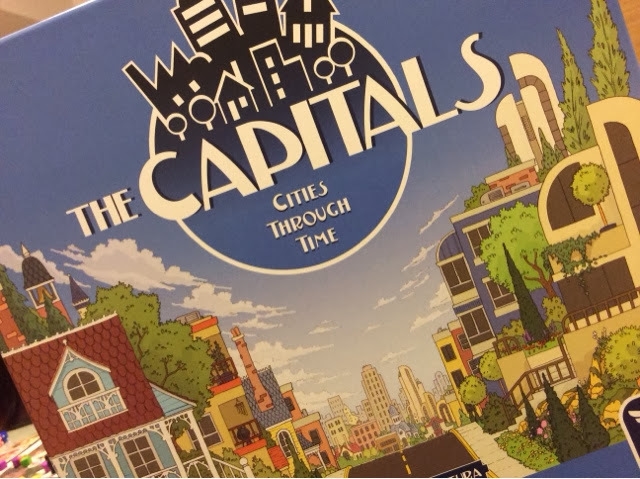 The Capitals is a city building game where players start with a small town; and after the culmination of 3 eras, players are hoping to be able to raise their town into something at least resembling a city of great prosperity, progress, and culture. I won't be able to completely describe everything about The Capitals as it has quite a bit of things going on and much of which can only be best explained with pictures of the tiles and the board. But I'm still going to try to describe it as simply as possible. The Capitals is played over 12 rounds ( 4 rounds per Era ) and the player who earns the most victory points by the end of the game is the winner. The actions and the flow sounds simple enough but it's the buildings and the iconography that really slows the game down a pace. But with more plays it is easily overcome. Turn Order is essentially about the players deciding how much you want to pay to go first or middle of the pack or last. It is always cheaper to go last. But your savings is not just for this turn. When you go last, it also means that the next time you want to pay for turn order, there is also additional savings as the multiplier to leave the space is lower than when leaving from the front spaces. So you kinda save twice if you stay behind the pack. And yes, money is SUPER tight in this game. Purchasing a new building is mostly free if you keep purchasing the new buildings that come out. Once the round is over, any un-purchased buildings become more expensive for future rounds. So if you see 2 buildings that you like, and if no one has bought it yet, then you can expect to pay at least a dollar or two during the next round to buy that building you covert. Purchased buildings are immediately placed into your city following placement rules and any effects that get triggered will be triggered immediately. Activate buildings. Each player may always activate one building per turn. Only if you have upgraded your power plants in your city will you then be able to make two activations ( or if you get the benefit from the Culture track, then you too may make one more activation ). Activating your buildings is one of the main ways to not only score points but to assist in the progression of your city. Its the ability of the buildings that help you to progress on the multiple tracks on the board. The board has 5 main tracks that you are constantly monitoring and fighting for. The first one is the money track. It shows how much money you have and how close you are into going into debt. Money is important as every round you will be spending money ( paying for turn order ). If you have no more money to spend, you have to take a loan and this results in you collecting negative point tokens. The next track is the culture track. Culture gives you 2 main benefits. Points at the end of the game, and the ability to take the tourist marker from the player who is the lowest on the track & making an extra activation. The player's tourist marker counts as a resource to activate buildings. So with someone else's marker, they have one less while you have one more. Small, but can be significant. The big points track is the population and employment track. Ignore this and you are eternally ( or at least until game end ) screwed. This track records two things - your city's population level and the employment level. Your employment level can never exceed your population level, so you must find the right combination or effects that can help you to push forward your population track, and then subsequently your employment track. Beware though, if your population track goes much further than your employment track, you will suffer penalty points at the end of the era. So you kinda want the tracks to be neck and neck. This is the big points track as you will start in the red. Negative. Boo hoo hoo. It takes awhile to finally get into the positive zone so if you stay there too long, well, all the best to you my friend. Eat them red chips like you love it. Om nom nom. This and the money track are the only tracks that don't involve direct competition with your opponents. Your position is only for your well-being and never taken into account your relative position to the others. The last 2 tracks are the progress track and what we call the ding dong bell track ( never got to know the proper name ). The progress track lets you upgrade your power plant so that you can make more activations and get more power ( resources ) to make the activation. If you progress fast enough, the later stages of power plants do award you with points. The faster you upgrade, the more power you receive as well. The ding dong bell track allows you to move faster on the progress track if you are sufficiently high on the track itself. By being behind you will suffer 2 types of losses, money loss and points loss. You lose a fixed amount of money as printed on the board, but you will lose 2 points per player ahead of you. So if you are behind in a 4 player game, haha, good luck ! After building and activating, its the meager task of upkeep, followed by end of era scoring if its the end of the 4th, 8th and 12th round. After the 12th round, you score for leftover money & resources and take into account any end game scoring abilities from your buildings, and the player with the most points ( after you deduct your negative points ) is the winner ! 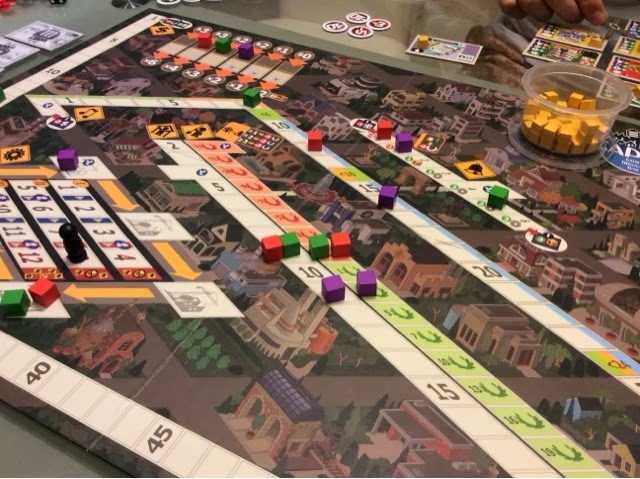 The main bulk of fun in The Capitals comes from the competition on the various tracks and the abilities and effects that the buildings afford you. There are a lot of possible chains and combos that you can pull off with the buildings in The Capitals. Some buildings give you bonuses when you build certain types of buildings, some gives you bonuses when you activate nearby buildings, and some simply let you activate them to exchange progress from one track to power another track. The buildings also give you immediate goodies or penalties once you first build the building. And some of the choices between what to build can be so excruciating. "Yes ! This building is perfect for my plans ! But what ! Minus this minus this AND minus this ! *#%*@#$"
The competition on the tracks are also fierce and rightly so. Being ahead in everything is of course the ideal situation, but nigh impossible. You will have to adjust on the fly on when you can abandon the race and fight a different war from a different front. I never felt that either track was unimportant nor extremely important at any particular stage of the game. It comes down to purely what you are aiming for and how best the track fits into your plans/schemes. The game and its mechanics really exude the theme in every possible way. Everything you do makes thematic sense when you are trying to run a city. Yes, you will go in debt early on but after you get your money making buildings, you will find it easier to float the boat. Being high on culture steals tourist from someone else's city and gives you points for your cultural history. Employment and population going hand in hand is a perfect example of good city management. I was really taken by this Euro game with its great use of theme. The Capitals does fail on some areas of the game. My biggest peeve is the iconography used in the game. It isn't as intuitive as I think iconography should be. I generally don't have problems with them, but in The Capitals, I kept having windows of doubt on whether I am interpreting things right. Another problem is the poor implementation of the game's components. First off, they really needed to give a better cheat sheet for the building abilities. We need pictures man ! this is NOT a quick reference sheet. Publishers, please take note. Seriously ? What's wrong with you man ? This is your cheat sheet ? Also, the game doesn't provide enough nor a good breakdown of essential components. In The Capitals, a lot of negative points are scored in 2s. Like when you build a building without following proper building guidelines, then you have to take a 2 points penalty. But their penalty chips come in 1s and 3s. And very little 1s at that. So a good chunk of the game is taking time to make change for chips. More chips in 1s or at least a good handful of 2s please. Especially when your game is designed to give as many negative points as possible. Lastly, the game does have multiple moving parts involved and small area specific rules that can be easily overlooked or forgotten during the game. 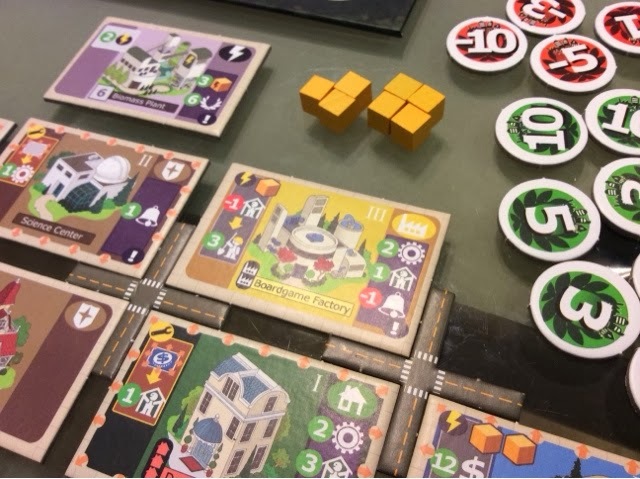 We did get a few things wrong on our first complete playthrough - taking penalty points even when we build the first type of building in our city, you have to forgo all activations to claim 1 point, opening the number of tiles based on per era and not on the board itself. Mostly minor but some can be game changing. Just another example of why streamlining gameplay is important all games. All in all, The Capitals was a big surprise for me. I expected something convoluted and merely a push stuff around the board kind of game, but it turned out to be much more than that, and in a pretty good way. As Eric said, I started talking a lot to myself during the game and trying to find out the processes of the game mid-game that he kinda knew I was pretty into the game. I think if it were simpler and easier to teach, I would have considered buying the game for my own collection. But I think its a tad heavier than what my group is used to so I guess I will have to play it at Eric's or whenever I can. But all in all, its a good game, and one I look forward to exploring in the future. I built the Boardgame Factory !!! Immediate win !! 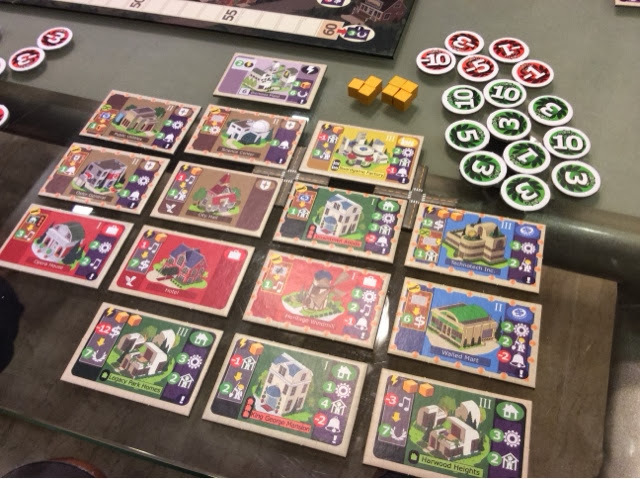 For those who like to know my opinions of The Capitals compared to Suburbia ( another fantastic city building game ), well, I think they both are really different although their theme is the same. Yes you are building cities in both, but the reason behind what buildings you build are mostly different. The engine in Suburbia is straightforward. Get more money early on, then find the right time to ramp up your reputation. But of course you must have a good combo of buildings to enable that to happen. And what type of buildings you build depend slightly on what the others are doing and what goals you are shooting for. The mid game challenges ( due to expansion ) and end game goals also add much replayability to Suburbia. In The Capitals, you only have one main goal. Score the most points. But how you get there is completely different from Suburbia. Everything you choose to do in The Capitals is relative to where the others are on the tracks. You want to be ahead and once you are you can relax a bit and do something else. There is a lot of back and forth in The Capitals compared to Suburbia. The engine in The Capitals is also based solely on your own city. Nothing the players do can change or modify your engine for better or worse. When it comes to luck, Suburbia definitely is more luck based than The Capitals. Suburbia has a strong reliance on what type of buildings come up; if you are gunning for most airports and only 2 appear, 1 for you and 1 for someone else, then say goodbye to the goal you have. Whereas in The Capitals, you can power your building to get stuff if the building of your liking doesn't appear for awhile. And most of the buildings have so many benefits that surely you can find one that suits your needs at the point of time. At the end of it all, if I had to pick one of the two, then I would pick Suburbia over The Capitals. All of the above put Suburbia on a higher pedestal than The Capitals for me. Although I will say that if I had the time and needed a good heavy game to tickle my fancy, please do wave The Capitals in my face and not Surburbia. When time permits, I would love to build a big darn fan(f***ing)tastic city. Great review. This is exactly how I feel about The Capitals. 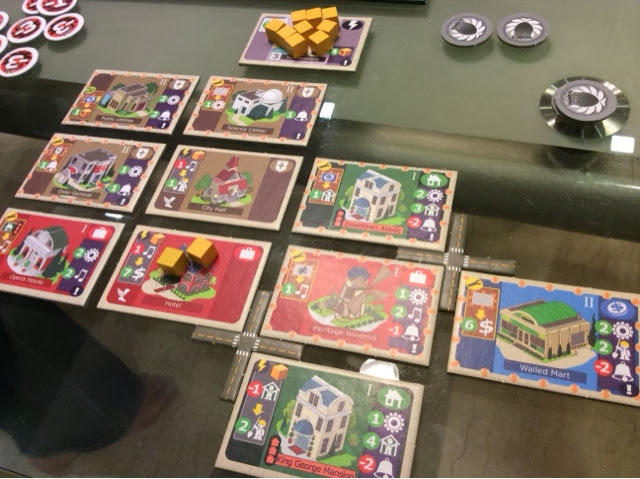 it scratches a different itch than Suburbia, but Suburbia overtakes it in overall smoothness and playability. Glad you enjoyed the review ! I very much agree in the smoothness and suburbia and I'm hoping to see another expansion soon enough !